A client, running a Windows 2008 R2 RDS/Citrix Xenapp 6.5 environment managed with RES Workspace Manager 2011 SR5, faced an issue with Outlook 2010 signature which disappeared with each new logon. Only a specific group of users was affected by this. Others had no problems at all. A user setting was already created to capture the user profile signature folder. Analyzing the corresponding UPF file in the profile folder showed that the signature was captured. Further investigation learned that when an affected user started a new session, the signature folder was created with the right content. Only after the ‘prefetching application’ progress window finished, the content of the signature folder suddenly disappeared. Apparently another user settings of a managed application somehow conflicted with those of Outlook 2010. 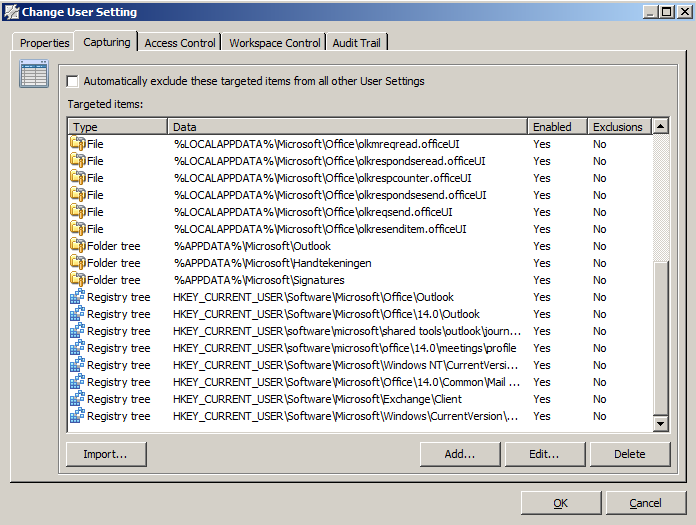 Zero Profile mode was enabled and entire HKCU and %APPDATA% were tracked for several managed applications. Analyzing the UPF files of these applications showed the capturing of the Outlook signature. With async loading of user preferences when starting a new user session this somehow resulted in the removal of the Outlook 2010 signature. Correcting the tracking parameters to more specific values resolved the issue.